Time-table "Adriatic Service 1938, Jadranska Plovidba d.d. Sušak." 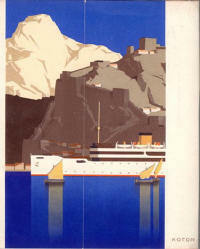 Travel brochure and schedule: "Dalmatienreisen 1936/37," 1936. By Hanns Wagula. Front cover. Travel brochure and schedule: "Dalmatienreisen 1936/37," 1936. By Hanns Wagula. Back cover. 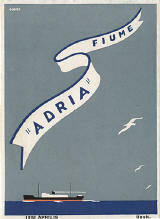 Timetable for "'Adria' - Fiume," 1936. Signed "Gauss." Front cover. 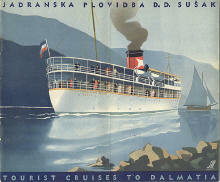 Travel brochure for the Jadranska Plovidba D.D Sušak," 1937. Time-table "Adriatic Service 1937, Jadranska Plovidba d.d. Sušak." Front cover. Time-table "Adriatic Service 1937, Jadranska Plovidba d.d. Sušak." Back cover. 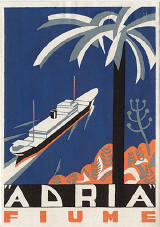 Timetable for "'Adria' - Fiume," 1936. Signed "Gauss." Back cover.